Our next and final friendly played in Gothenburg. I think we might draw or narrowly lose this. Against actual "home" teams we aren't great and Sweden are a step above our 2 previous opponents, whislt still not great. Played in Sweden might make things tough but hopefully we can do enough. Just as long as we get out of there injury free, I don't care about the result. Again, if we get out injury free, I don't care about the result. How many friendlies are you having?! This is the last one, and I think its one too many. We have raised the bar high, and if we win that bar is going to be even higher to the point where we have to get out of the group, otherwise it would be a failure and it will be down to how many meaningless games we've won. there's a week between the WC starting and this friendly so I'd imagine they are just getting more time in to understand the team. We've had 3 though, as opposed to Uruguay, Argentina and Colombia who have only had 1. I prefer to have 2 friendlies max, 3 if things don't go well but if things go too well (like with us) having 3 can potentially be dangerous. I think the biggest issues with friendlies is picking up injuries but beyond that staying match sharp before a tournament doesn't hurt. I also think this really should have been played on Friday giving players time to recuperate but the guys running your NT would know better. i don't see a big issue with building momentum and confidence by playing/winning friendlies though. Farfan starts in place of Flores, meaning this last World Cup friendly will be an experiment. 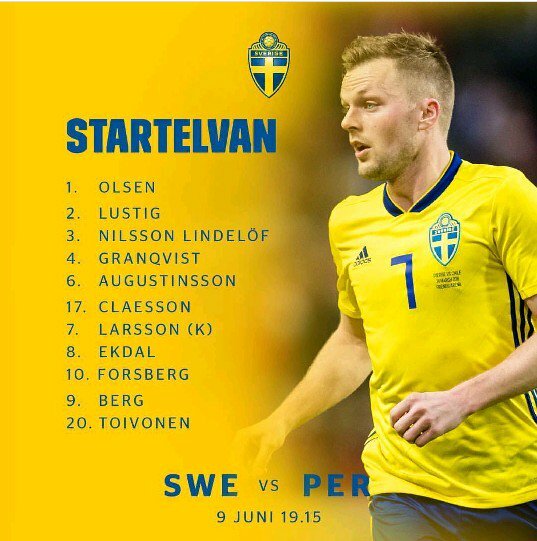 Sweden starts with their first choice XI. Thanks Nudge, couldn't find it on Twitter. Should go in your favour as Guerrero is used to experimenting. Absolutely disgraceful that you are referring to @Blue as a monkey. The staff room accept your resignation with immediate effect. Absolute disgraceful that you are referring to @Blue as a monkey. The staff room accept your resignation with immediate effect. We've slightly edged it, but credit to Sweden. They are the best side we've faced so far in 2018. They remind me of Iceland but a bit less limited. I don't think we've dominated but we're doing well enough after a bit of a sloppy start. I much prefer the 4-2-3-1 over this new formation. Ends 0-0. I'll give my overall thoughts later. Don't think it was a bad performance by any means. - Sweden have won me over and I think they will get past the groups. I don't see a lot of technically gifted players in there, but they are more gifted than say Iceland and just like them, they are very well drilled. - We played a good game, but we lacked in shots. If we shot more at goal, we could have easily taken the game, but our attackers were a bit lazy in that department. Only Yotun got a few shots in and they were from long range. - Alberto Rodriguez is an absolute monster at the back. Unpassable. - Carrillo didn't have as bad a game as some Peruvians are claiming. A step down from his last 2, but I've seen much worse from him. Same with Cueva, I didn't think they were awful and some of the critiques are a bit harsh. - I was spot on that Farfan and Guerrero can't play together. It was to be Guerrero or Farfan as the number 9 and then Flores - Cueva - Carrillo.